only needed three outs to secure its fourth win of the season. batters as Gallaudet went into the bottom of the ninth down one run, 8-7.
hits, three walks and struck out one batter in 1.2 innings of work. of nine doubleheaders, for GU begins next weekend. or is taking a break? on his only field goal attempt of the evening, in his UC Davis debut vs.
teams that play in local indoor leagues. Best to just leave it at that. stabbing curtailing his pitching career. Dummy Hoy wasn’t the first deaf major leaguer. hockey stick to slap away shots. allowing any fast break shots against them. It worked. The next game, the regular goalie showed up. marking their third straight 20-win season. recruited to Brigham Young University for his senior year. — quarterback knowing no ASL! the Athletic Department and the CSD community with his warm presence. having a lot of potential to being one of our fine runners. overtime to make up for the tied game that was played at KSD on August 29. After that, the homecoming game would be played in full four quarters. occurs only when there is a tie at the end of the fourth quarter. the first round of overtime and in each overtime when there is a tie. touchdown on the third play and won the overtime game 14-8. NFL or college is unheard of. him a free car but don’t have money to buy a car. to make the purchase possible! some deaf basketball clubs years ago in USA. those hoping for her to win. outdoor track during her freshman year. and throw farther,” Timpson said of her step-daughter. when she competed in the 2017 Deaflympics in Turkey. track team. She won the silver medal in the high jump event. So, should we be jealous? club basketball game in New York. and does not use sign language. the bottom of the sixth inning. and later scored the game-ending run on a Cairn wild pitch. the game as she helped to get GU on the scoreboard in the first. eight-run mercy rule over the Highlanders (6-4). way home from first base to end the game. four additional runs in the second inning to take an 8-4 lead. allowed one unearned run on three hits, one walk and struck out five. while Zacarias (four RBI) added a double. Thursday, April 5, at 3 p.m.
Loyola-Chicago is in the Final Four. the school – and tranferred to DePaul. He has been inducted into the DePaul hall of fame. has a deaf Sports Information Director. on and off since early seventies. GU almost steals game away from No. 9 Frostburg St.
on second base in the ninth before the Bison lost 10-8.
as Gallaudet had tied the game. freshman pitcher Quintan Polito (Omaha, Neb.) to take a 10-7 lead. allowed Gallaudet to score its eighth run of the game. Drolsbaugh (Lansdale, Pa.) grounded out to end the game. Bobcat batters out before Frostburg scored four times to take a 4-0 lead. Frostburg’s lead to 6-3 after five innings. March 30, at 3 p.m. in a non-conference game. averaging 1.3 points per game. Edwards has yet to secure a rebound in 3 games this season. to catch the fly to prevent a home run. a 7-0 forfeit win while none of the statistics from the second game count. threw 57 pitches in the first inning. more hits in the game and six had two or more RBI in the win. shutout victory as she struck out a career-high 13 batters. Trinity Washington had three hits in the loss. 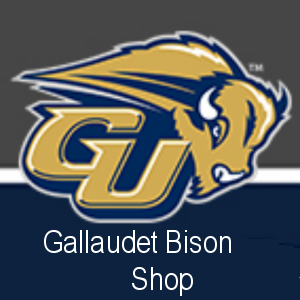 This is not the first time Gallaudet has received a forfeit from Trinity. players and were forced to forfeit. doubleheader on Monday, March 26, at 3 p.m.
second game, it is wiped out! additional run each in the final two innings. bullpen to close out the game. straight entering their game with the Bison. last weekend at the state powerlifting meet. He is the second Louisiana coach with this honor. The first one was Jim Peyton, inducted in 2012. There are 35 inductees in the hall right now. won this tournament last year! was able to walk on the Washington State team as a 2016 freshman. bring back their first ESDAA boys hoops title since 2010. Deaf the weekend of Feb. 16-18. Katzenbach School for the Deaf in New Jersey. 5.9 steals and 5.1 assists per game this season. about 300 kids. They even field junior varsity and varsity football teams. others are still able to hear the refs blow the whistle to stop play. Other than that, basketball is still basketball. for the most part,” Carmody said. sixth year guiding the team. based on being able to communicate with their players. again next year at the competition in West Virginia. About 200 athletes from 19 countries are taking part in it. Championships. The competition will finish on 24 March. Virginia has a hearing loss. his heairng loss is not that severe enough! before enrolling at Navy in 2019-20.
either college if Navy rejected him. match he lost by a TKO. His career record is 14-12. One of the deaf teams is Canada. Details on that tournament is not available.